Bob Kinney, designer/builder of the HRH, considers himself a practical “electro-mechanical applicationist.” He has built things since early childhood: cars, motorcycles, houses, airplanes, Queen Ann furniture, carousel horses, and so on. Bob was born in a small town in Connecticut where, as a young boy, he and some friends would sneak away from camp to visit a nearby factory that was manufacturing curious rotary-wing machines. Looking back, Bob is convinced that the man with the distinctive Russian accent that continually chased him and his friends away from that factory was Igor Sikorsky—father of the modern helicopter—and only later understood that those curious machines were helicopters. Bob has had a lifelong fascination with flight. In his teens he explored Bensen Gyroplanes and later taught himself to fly ultralights. Eventually he was introduced to the world of kit planes and built a Q2, which he soloed upon getting his pilot’s license. After the Q2, he built a Glasair; but during these “fixed-wing days” he remained haunted by the vision of vertical flight. A gyroplane, which required a runway, wouldn’t do. He surveyed the homebuilt helicopters then available, but was discouraged by their use of 2-stroke engines and belt-driven tail rotors. Further, he sought a helicopter with “style”—something he found lacking in most designs. Bob realized he would need to design, based upon his in-depth knowledge, his own helicopter, incorporating his “wish-list” of features: a Subaru 4-stroke engine, shaft-driven tail rotor, year-round, cross-country flight capability; ease of maintenance; etc. He knew that many people attempt to design and build their own helicopter, but few succeed. 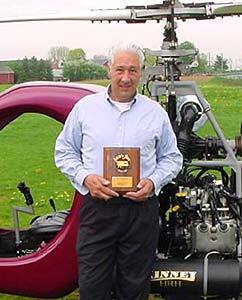 One year, one month, one week and one day passed from the day Bob purchased the first piece of frame tubing to the first flight of the Kinney Hot Rod Helicopter. During this time the design itself was finalized. Not only was the performance of the HRH outstanding, but after 300 hours of flight in less than three years, maintenance has been almost nil. The HRH has been on numerous cross-country flights and received various awards. Pre-flight checks are simple because of the open design. Winter operation is possible thanks to a catalytic heater and removable doors. For travel, many landing sites are available to helicopters that are inaccessible to airplanes. The HRH exceeded Bob Kinney’s fondest expectations, every flight being an adventure. Vortech, Inc. has been in the homebuilt helicopter industry since 1970, specializing in plans, kits, parts and components for the hobbyist. The Kinney HRH is the most recent and finest homebuilt Vortech has had the privilege to work with.